Are Timeshares Ever Worth the Investment? 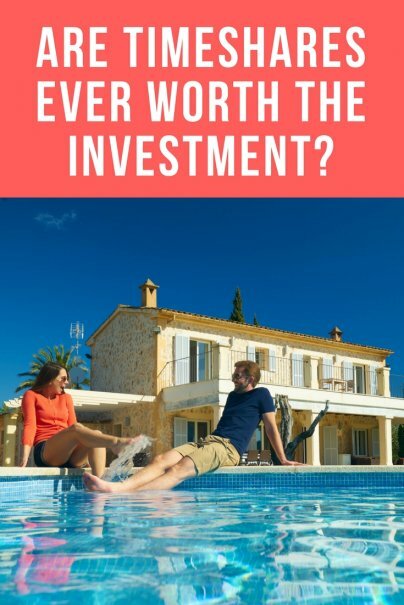 Home » Frugal Living » Travel » Are Timeshares Ever Worth the Investment? Despite scams and hard sales tactics that have tarnished the reputation of timeshares, the American Resort Development Association says sales are rising — and timeshares are attracting increasingly younger buyers. The average age of today's timeshare owner is 39. According to MarketWatch, the average price of a timeshare is $16,000, putting them within financial reach for many consumers. But is buying a timeshare a good investment? The general idea of a timeshare is that a group of people have the right to use a vacation property and they split up the year among them. Usually each timeshare owner gets one week a year. A true timeshare is deeded. You own a specific unit of the property, and you can use that at a designated time every year. You may own it for the rest of your life, for a given number of years, or until you sell it. Another arrangement is called "right to use," in which you lease a unit on the property from a developer for a certain amount of time over a set number of years (generally 10 to 50 years). You may get a specific unit for either a fixed or floating amount of time. With the floating option, you can pick a week within a certain season of the year, and you have to reserve it in advance on a first-come, first-served basis. A third option that's popular with major resort chains such as Marriott and Hilton is a points club. You buy an allotment of points and can use them for stays at different properties around the world. The cost of a timeshare depends on the location and the property. In addition to buying the timeshare, you'll be responsible for annual maintenance fees and sometimes property taxes. Maintenance fees will likely increase over time. The main feature that makes timeshares attractive to some people is predictability; you get a set place to vacation every year. Once you purchase a timeshare, you are guaranteed to have a week (or weeks) at the location where you bought it. An overcrowded market also means you may be able to get a good deal by purchasing a used timeshare from a current owner. You can find timeshares for sale on the secondary market on sites like Timeshare Users Group or RedWeek. In addition, you may find a timeshare more comfortable than a traditional hotel. For instance, many timeshares include a kitchen or kitchenette, which you won't find in most hotel rooms. They may have multiple bedrooms and separate living areas, making them more like an apartment or villa than a hotel. Points clubs and floating timeshares give you the most options, but even a fixed property may offer some flexibility. You may be able to swap with other owners, or rent it to outsiders. Some properties have online portals that facilitate these types of exchanges. Websites such as RedWeek allow you to sell weeks you don't plan on using. One big disadvantage of a timeshare is that it may limit your vacation choices. To get the most value from your purchase, you need to use the timeshare every year. But if you're tied to one destination, this could get boring. Furthermore, it's almost a given that you will resell a timeshare unit for less than what you paid, because so many people are selling these types of units. The Federal Trade Commission clearly states on its website that "the value of these options is in their use as vacation destinations, not as investments." When purchasing a timeshare, it's very important that you know what you are buying. Timeshares are often sold using high-pressure sales tactics. As with any major purchase, take the time you need to do research before you buy, and ask lots of questions about what's included and the costs. Often you'll see promotions promising rewards such as a free trip in exchange for attending a timeshare sales pitch, but be ready for relentlessly pushy sales tactics. In an interview with MarketWatch, former timeshare sales rep Dana Micallef warned that salespeople are trained to "Dress it up (as an investment) and promise them [the] world that they can resell it, when the chances of selling it are slim to none." I attended one of these presentations in Puerto Vallarta when my aunt, a timeshare owner, let me use a free week she couldn't use. I sat through an exhausting three-hour meeting in exchange for one lousy breakfast. Be very cautious if you are buying a unit that is not yet completed. Don't make a payment until construction is finished, because you may get ripped off. The FTC recommends that you place the money in an escrow account at a local bank until the property is ready. It also advises putting a "nonperformance" provision in the sales contract stipulating that you'll get your money back if the developer goes bust or defaults before your unit is finished. If you buy a timeshare and later want to sell it, you'll need to be careful, too. Scammers have been known to target timeshare owners, promising them they've got a buyer but demanding you pay filing fees and closing costs first. The buyer never emerges, and then you can't get your money back. If you still want to buy a timeshare knowing all this, make sure you view it as a vacation purchase and not an investment. Shop around before committing your future vacation stays, especially if it's for one particular location.